Sit upright with your spine tall. If you are uncomfortable sitting cross-legged on the floor, you may want to sit in a chair with both feet flat on the floor. Keeping your spine tall will allow your breath to move in and out of the chest cavity with less resistance. Bring your right hand up to your face. Practice closing off one nasal passage at a time. Usually the thumb closes the right nostril and your middle finger closes off the left nostril. Experiment using other fingers if this is not the most comfortable combination for you. Start by exhaling fully and then closing off the right nostril with your thumb. Inhale and then exhale through the left nostril. Switch and close off the left nostril. Inhale and then exhale through the right nostril. Repeat for three or more cycles. Return to your natural breath for a few moments and then begin ANB again. When you feel ready you can extend the number of cycles of ANB. If you begin to feel tense or panicky return to your natural breath and focus on a slow gentle rhythm of breathing. Try to always stop and start with your left nostril. The left side is believed to activate the calming and cooling aspects within the brain. Eventually you can work up to practicing for 5-10 minutes. If you find your mind wandering, gently guide it back to attending to your breath. If allergies make this practice difficult, using a neti pot can help tremendously. The combination of the neti pot and ANB can greatly reduce the symptoms of seasonal allergies. 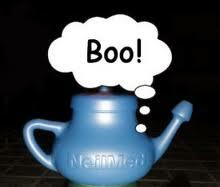 Are you still afraid of the Neti Pot? Many of my students have been commenting on allergies and colds. Not only is weather likely to be effecting your quality of breath, but we are all turning on our heaters again. Particularly if you have forced air heat, you may want to spend some time cleaning your vents, duct-work and replacing your furnace filters. This will help cut back on the particulate matter blown into the air within your home. This is also the time to be making regular use of your neti pot. If you still feel hesitant to try it out, I highly recommend giving it another try. To make the experience as comfortable as possible make sure you use plenty of salt and use warm water. It can feel a bit strange the first couple of times you use it, but after that you will wonder how you lived without a neti pot. The practice of nasal irrigation originated in India, but now many people around the world use it on a regular basis. It can be used daily or as needed. Using a neti pot one can use warm salt water to gently cleanse the nasal passages. As the water flows through your nose it washes away pollens, mucus, viruses and bacteria. The nasal passage, with its fine hairs and mucus membranes, is one of the ways nature protects us from illness. The neti pot can have an amazingly positive effect on your body’s ability to stay healthy and fight off sickness. Here in Boise there are a number of places to purchase a neti pot. I bought a very pretty ceramic one at the Boise CO-OP for about $12. They all come with clear instructions and the salt can be purchased right off the same shelf. Below are some basic instructions and a short video to give you an idea of how it is done. 1. Fill the neti pot with warm water and the recommended amount of salt. Hot water is dangerous and cool water is not soothing. You may also play around with the amount of salt you use, to find out just the right amount for your greatest level of comfort. 2. Tilt your head to the side. One ear pointing down toward the sink and your forehead is lower than your chin in relation to the counter. 3. Insert spout of neti pot gently into the raised/top nostril creating a seal between the neti pot and the nostril. Try to relax. If you are too tense the solution just won’t flow. Breathe gently through your mouth throughout the process. 4. Raise the neti pot slowly to develop a steady flow of saline solution through the upper nostril and out the lower nostril. 5. When you’re done, exhale firmly several times to clear the nasal passages. 6. Reverse the tilt of your head and repeat the process on the other side. 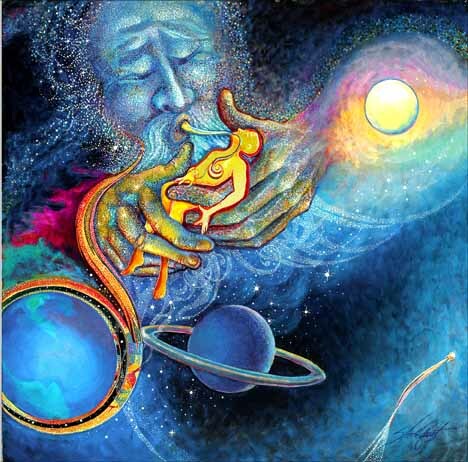 There is a great tutorial on pranayama at the site below. Click on the demo at the bottom of the page. It has a visual tool that I would never have thought of, but found it very helpful. Have fun, relax and watch the tension just slip away. 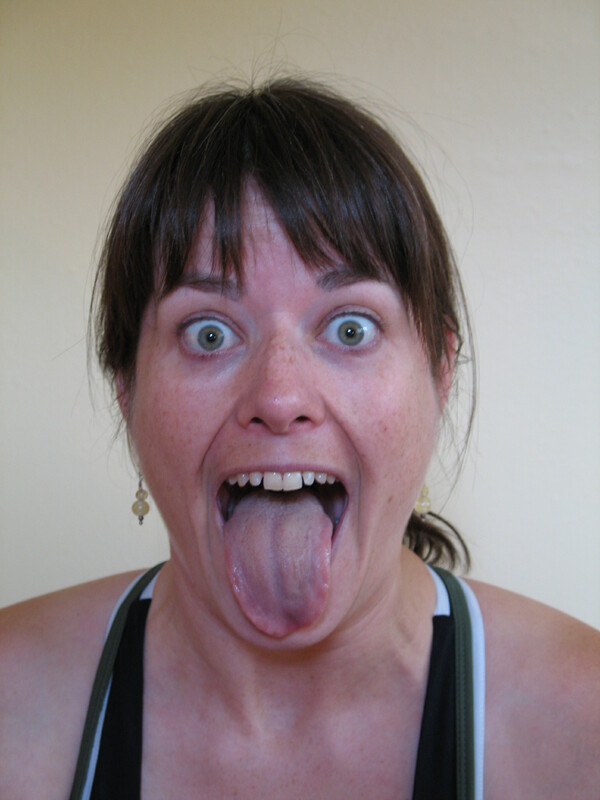 This may look very silly, but it is a very simple and powerful breathing exercise. Try it. What is the worst that could happen….you could make yourself giggle? 1. Scrunch all the muscles in your face and inhale deeply. 2. Exhale fully, while sticking your tongue out and opening your eyes wide. 3. Repeat several times and then relax. For any of you who are feeling the effects of sage allergies or just aren’t breathing as clearly as you would like…..I highly recommend using a neti pot. It can feel a bit strange the first couple of times you use it, but after that you will wonder how you lived without a neti pot. What if I get dizzy or feel panicky? If at any point during an exercise you feel dizzy or panicky, return to your accustomed breathing. It is not unusual to experience a mild sense of panic when first learning to manipulate the breath. This exercise is for you and it is important to listen to your body and it’s response to your breathing practice. After several seconds, try returning to your practice. If you continue to have this problem you may want to discuss it in more detail with your yoga teacher and doctor. How often should I practice? At first, practice this exercise several minutes at least once per day. Many people find it comforting to start or end their day with breathing exercises. Gradually increase the amount of time you spend doing this exercise as your strength and comfort increases. Why does this feel so awkward? Babies are born naturally breathing with full usage of their diaphragms. As we grow and develop many factors contribute to our breathing habits becoming shallower. Just as it feels awkward the first time you play a sport or return to the gym after a long absence, it will also take practice and time to rebuild strength in the diaphragm. At first, you’ll probably get tired while doing this exercise. But keep at it, because with continued practice, diaphragmatic breathing will become easy and automatic. First of all what is the diaphragm? The diaphragm is a large muscle that runs horizontally across the base of the ribcage. Through contraction and relaxation the diaphragm controls our lungs, either allowing air in or pushing air out. Just like other muscles, by working them in intentional ways they grow stronger. 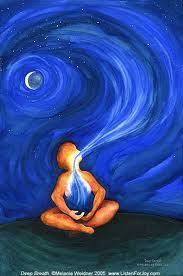 As we become more used to engaging and working our diaphragm we can increase the quality of our breath. Increasing the strength and stamina of the diaphragm is the first step to not only increasing breath quality, but also to easing our introduction to other breathing exercises. The following steps will guide you through a simple diaphragmatic breathing exercise. Breathing exercises can be practiced lying down, sitting in a chair or seated on the floor. The important part is that you are comfortable and able to maintain good posture. 1. Place one hand on your upper chest and the other just below your rib cage. This will allow you to feel your diaphragm move as you breathe. 2. Keep your shoulders, head and neck relaxed. 4. As you exhale let your stomach muscles fall inward and upward. 5. Repeat for three breaths then return to your accustomed breathing for several cycles of breath. When you are ready draw your attention again to your hands and your breath.